Here is my main pantry: a cupboard with glass doors that is built into a niche in the kitchen. The little labels in the picture show the main groupings of my pantry basics, although the organization is far from perfect. You can tell I eat a lot of oatmeal and yogurt because of all the reused containers (with the label scrawled on using a sharpie)! My mother was not happy to see all these old yogurt jars squatting around in my pantry and pleaded with me to go and buy some glass jars that would look "more decent". But I'm not ashamed about reusing things -- and they do stack perfectly. This is my spice box: a round stainless steel container with 7 cups. A container like this one sits near the stove in almost every Indian kitchen I have peeked into. It is filled with the most common spices that the cook uses- and these might be different for different cooks. Mine has red chilli powder, turmeric, a mixture of two lentils, cumin seeds, mustard seeds and a couple of spice mixtures that I commonly use. Most of these are the spices used for "tempering"- a common first step for many Indian dishes, where spices and seeds are tossed into hot oil where they work their magic and flavor the whole dish. It is very convenient to open one box and have all these spices at hand; you have only a few seconds to do the tempering before the spices start burning. I got my spice box during my last trip to India . My grandmother overheard that I was going out to shop for one, and told me she had one stashed away somewhere. It turns out that she received two spice boxes as gifts in her own wedding (well over six decades ago) and had saved one! She gave it to me. It is a wonderful box- and its sturdy construction reflects the way things were made in those days. So here I am, the proud owner of a spice box that was given to my grandmother as a wedding gift! It is the most treasured portion of my pantry. On Saturdays, we peek into Other People's Pantries. Come on -- show us yours. Here's how. 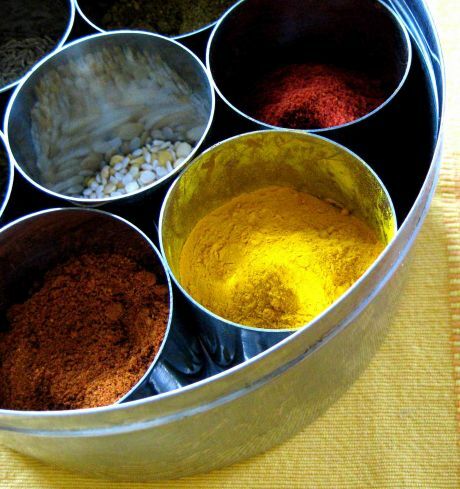 Thanks for explaining the usefulness of those beautiful spice boxes one sees in Indian cookbooks! I have tried to duplicate that function with re-used containers and plastic bags, but I guess generations of cooks are bound to have done better. How fun seeing Nupur's pantry! Her food always looks so good to me, so it's fun seeing a glimpse of where this delicious food comes from. Boy, if that's disorganized, I don't know what you'd call mine! The house I'm currently in has no pantry (guess the prior tenants didn't cook ever? ), so we propped up a metal bookshelf sort of thing and called it a pantry. ;-) I have pantry envy. I like the spice box, as well. Seems like a very handy tool to have. I'm with Mike there, if that's disorganized I'd best pull my name from your list Lydia. Nupur that would have to be a well treasured spice box! A beautiful story! Kalyn, thank you :) you are really going to have to come over and taste it for yourself before you decide whether it is delicious or not! Mike, it really is hard to be without a pantry! Yes, I sure am lucky to have one that is built into the kitchen :) The spice box is a very handy tool to have if you have a few spices that you use all the time. These individual cups inside the box are not air-tight, so the spices need to have a high turnover or the spices will lose their flavor. Tanna, I was truly amazed when my grandma said she had saved that box for that long! I always complain that she never throws anything out but this time it worked in my favor :D Thank you for reading my little story. Lydia, thank you so much for this opportunity. I am so thrilled at my pantry being pictured on your blog! Your pantry looks great. How sweet that your grandmother saved a spice box from her wedding gifts(from 6 decades ago! )for you. What a great story. Very nice! And neat! ;-) I especially like your spice box and all those spices. Thanks for sharing Lydia and Nupur! We have ALOT of cleaning to do before we submit our pantry pics! It's been a busy cooking week! Priya, welcome to The Perfect Pantry. You do not have to be a blogger to show us your pantry, so whenever you wish, please email your photos to me. For the chronically unorganized, it is so helpful to see how people put their pantrys together. I have learned a lot already. Nupur, your spice box is a wonderful tool. hi nupur, this is my first time here. oh, how i love your writings.i'm a Malaysian. our food is much influenced by Indian cooking. Have you tried Malaysian food ?Do you know where is Malaysia ? the spice box is gorgeous! I have a tin that used to hold Lebanese pastries where I keep opened packets of spices. Opening it is such a treat. Meg...yes, my grandmother has so many goodies stashed away that I can easily go shopping right in her room! Paz, thank you. The spice box is easily my favorite part of the pantry. White On Rice Couple, yes, a busy cooking week does result in a mess. Nasisah Ismail, this is Lydia's blog and not mine, so the compliments should be directed to her! :) Yes, I do know where Malaysia is but have not tried much of the food from there. Lobstersquad, I agree: the aroma that wafts up when a box of spices is opened is inspiring! Nasisah, welcome to The Perfect Pantry. Please be sure to visit Nupur's wonderful blog about Indian cooking, too. I have been to Malaysia and love Malaysian cooking. When we traveled there, I discovered many new foods that have become some of my very favorite dishes: laksa, and especially mee goreng.